I haven't been feeling very inspired to blog this week for some reason, so I decided to go through some of my magazine clippings to reboot. Well, it worked. These Beau + Ashe 'Tongela" faux leather booties from Shoedazzle, were more than enough to get my creative juices flowing again. Unfortunately they are completely sold out, but I still had to post them, because they make me happy! Here are two looks for spring that I "must have". 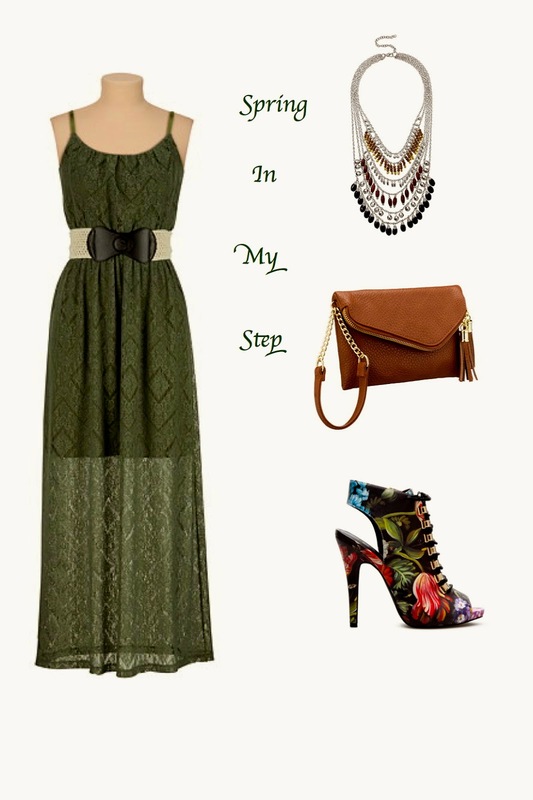 Lace Maxi dresses~Maurices~here and here/Top image~Necklace and Handbag~Maurices/Beau + Ashe slingback bootie and Betsy Johnson peep toe bootie (sold out) other options here and here/Mint green clutch from Mimi boutique/Lariat necklace. Hope you are all feeling inspired this week! P.S. Check out Maurices.com when you get a chance(great styles and great prices). I recently discovered it through another fashion blogger I follow, devonrachel.com.